LSE is, undeniably, a globally leading university central to the growth of the knowledge base in the social sciences. But even more than that, it has actively promoted the use of that knowledge, to influence policy and practice. LSE really does live up to its motto, understanding the causes of things, and has, importantly, also stayed true to its mission to stimulate change for the ‘betterment of society’. As alumni of this great institution you are a significant part of the School’s success and integral to our capacity to maintain and grow our global reputation for excellence. It’s not surprising that my first impressions of the School have been shaped by the passion with which people describe their experience of studying and working here. I see a well-deserved confidence that comes from the School’s long history of global relevance and influence. Importantly, this confidence is coupled with the recognition that we currently face some significant challenges, including responding to Brexit and the rapidly changing environment in UK higher education regulation. My role as Chair of Council is to support the executive and senior management committee to deliver the School’s strategy within the context of these changes. I am impressed by how LSE Interim Director Julia Black and her team are addressing this challenge; supporting our continuing research excellence and delivering the education strategy to ensure we excel at all that we do. Our alumni are among our greatest advocates and supporters and the School is strengthened by your achievements. I hope that you continue to benefit from your association with LSE in your lives and careers. The School offers important networking opportunities so that you can get support and remain connected wherever you are in the world. Colleagues in Alumni Relations and LSE Advancement as a whole will try to keep you up to date with what’s going on at LSE so that you are aware of innovations and change from the time you were here. LSE LIFE, the School's new centre for academic, personal and professional development for undergraduate and master’s students, is one such example which I had the pleasure to visit last week. The Alumni Echo also gives you an idea of the world leading research initiatives at LSE and shows why being a part of the School is so rewarding. I hope you share my excitement, informed by your own experiences and memories, and I very much hope I get a chance to meet many of you over the course of this next year. 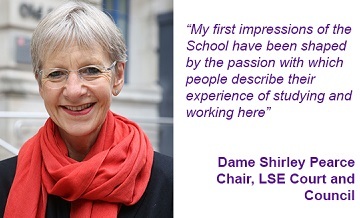 Dame Shirley Pearce brings a wealth of experience to the role of Chair of LSE Court and Council, having previously served as Vice-Chancellor of Loughborough University, and as a Pro Vice-Chancellor and Dean of the Schools of Health at the University of East Anglia. She has also recently served as a trustee and Council member at the University of Cambridge, and was a board member at the Higher Education Funding Council for England (HEFCE) from 2009 to 2015, where she chaired the Review of Philanthropy in UK Higher Education.